Hello and welcome to our final week of Finding Nemo/Dory fun. This week I am going to show you some really simply and cool ideas for decorations. Now these could be used for a themed birthday party or a really cool movie marathon of both the films. They also work for any Under the Sea or Little Mermaid party too. Lets start with some free printables, below I have included a gallery for some really cool items you can print out and use. Now you have these great printables how about trying to create a scene like the stunner below. I love the use of the Chinese lanterns with some Crete paper attached to make jellyfish. I have also included a link to a finding dory scene to save you some time. Remember to have a look at my other Finding Nemo/Dory posts from the past month, just use the buttons below. This is a super cool way to make some great sea weed or coral using just pool noodles and a Sharp knife or Stanley knife. This is a nice simple idea, fill a vase with those stretchy toys you can find from pound shops. They look like some sort of sea creature. I think these are called "Koosh"? But they are normally available everywhere. Another use for all of these ideas is in a school classroom. I know most classes pick different topics to cover every term or half term and creating something special in the classroom is a great way to get the kids excited and engaged with the material. This is my favourite idea, to recreate it I would use some table cloth but you can get plastic table cloth in rolls. Get the two shades of blue and attach it to the ceiling under the lights. This will have a great effect of making the room have a blue tinge. Just make sure that if your lights tend to get hot that the plastic has not too close to them. I have LED bulbs which dont get hot at all, remember safety first I don't want any fires. Now you just need to cut out a large turtle and small turtle out of cardboard, as long as you get a decent shape it doesn't matter what they actually look like. 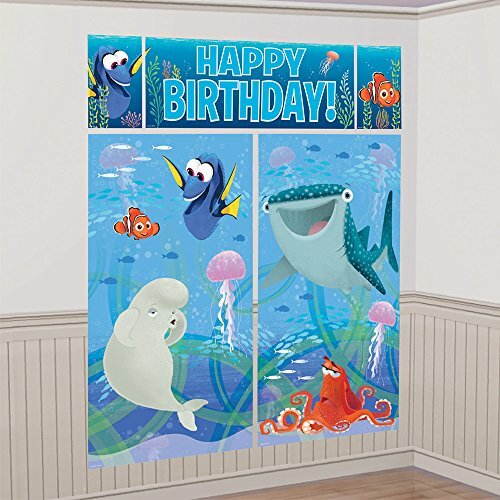 Place these cut outs on your newly installed ocean and boom, you have a jaw dropping decoration. For ease I have included a turtle template above too. Before you go please make sure you check out all of our other Finding Nemo/Dory ideas from the blog posts below. I'll see you next week when we start a brand new theme.